The following article was originally published at The Prepper Project. 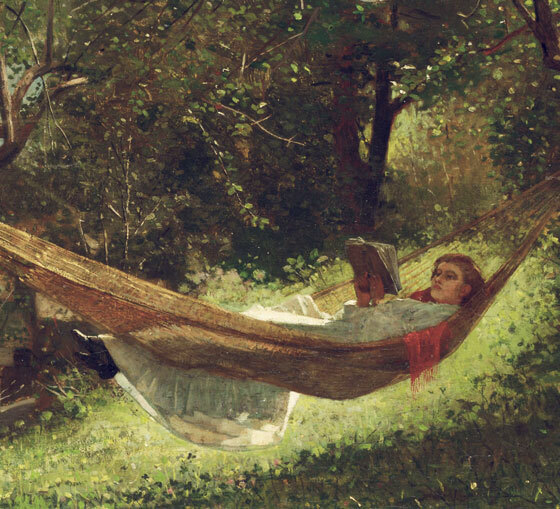 “Girl in Hammock” (detail). Winslow Homer. Sometimes I wonder: does a person’s garden follow his personality? Is the love of weeds, praise of borderline chaos and embracing of wild animals simply an outgrowth of a disordered mind? On the flip side: are perfect beds, straight lines and precisely timed plantings the result of latent OCD? Ultimately, it’s okay if your gardening reflects your personality. The main thing to remember as a prepper is this: no matter what style it is, your garden must create value. Your garden must create value. If your garden is a sinkhole for resources, you’re doing it wrong and it’s time to make a change. Are You Too Lazy To Pull Weeds? Then you need to garden in a way that keeps weeds from becoming a big problem. Consider going for the Back to Eden method or another deep mulch style of gardening. Weeds WILL consume resources that should be going to your plants, meaning they’ll be eating your potential harvest. If you know they’re your Achilles’ heel… wear boots! Another way to deal with weeds is via running goats or chickens. If you’ve never been a good gardening but are good with animals, maybe you should simply raise animals instead of a big garden. Let your garden patch become pasture in which you can rotate flocks or herds or both through the weeds – then trade the resulting eggs/meat/milk/cheese for produce. Are You Too Lazy To Water? Maybe it’s not a matter of being too lazy. Maybe you’re just really busy so you tend to miss waterings until you notice your tomatoes are dying on the vine. In that case, your garden needs to be watered in some way other than by hand with the hose. Consider getting yourself some automated irrigation. Or start gardening onhugelkultur beds. Another option might be to start gardening in wicking beds, an aquaponics system or just grow aquatic vegetables in a pond. Are You Too Lazy To Dig Beds Year After Year? Then the solution is to plant a food forest. A food forest mimics a natural woodland. You basically take a mixture of edible trees and shrubs, along with nitrogen-fixers and mulch-producing/nutrient-accumulating plants, and create a planned forest. Your digging and hard work is all on the front end when you plant the system. After a few years, the shade of the trees and the falling leaves will take care of the weeds and make the soil in your forest garden spongy, moist and filled with earthworms… who then dig and cultivate without you. Rather than digging a new cabbage bed every year, you can plant perennial leaf vegetables like chaya, edible hibiscus, basswood, Good King Henry or any number of other things. Rather than digging and weeding a watermelon or strawberry bed, you just plant Japanese persimmons, mulberries, apples or any number of other tasty tree fruit. Are You Too Lazy To Turn A Compost Pile? Well, great! So am I.
Stack organic matter anywhere and it will break down. Dig a big trench then fill it with kitchen scraps over time, then plant on top. Pile all your leaves as mulch around the landscaping and it will all eventually break down into compost. As I posted recently, I stacked compost on a lousy garden bed last year and it fed me with piles of pumpkins… and there are still pumpkins on the way. You don’t need to turn compost to make it break down. If you’re short on time, let a longer period of composting time work in your favor. Just don’t throw out any potential soil fertility because you’re not able to get out and turn. Find ways to incorporate everything biodegradable and your gardening will get easier from year to year. Are You Too Lazy To Garden At All? Maybe it’s not a case of laziness – maybe it’s just that you’re a busy homemaker, police officer, salesman or plumber. That’s okay. If you’re able to make enough money to feed yourself, perhaps gardening isn’t in the cards for you right now. In that case, I’d still make sure you know HOW to garden, just in case there’s a point in the future where you NEED to garden. Even maintaining a small container garden on a back porch can help keep you in practice: but if you can’t even find the time for that, I recommend you take a wild foraging class and make friends with people that DO have the time to garden. I’d also grab good gardening books (not ebooks, unless you print them) and a copy of Survival Gardening Secrets for the future. You can’t beat the quality of food that a home garden provides – but it’s true; sometimes there’s just no time. If there is time, however, kick your “laziness” with some of the gardening solutions above. Now pardon me… I’m going to go lie in my hammock and think about fall crops. For more gardening and prepping advice, visit www.theprepperproject.com. Some interesting thoughts and questions ! Thank you for sharing! It was really interesting! David- I have a question about mulch. I watched the Back to Eden movie and then mulched my raised beds with cypress mulch from Lowe's. It was full of mushrooms. Not a problem if they're edible of course. ;) But these are like weeds and have completely taken over one bed- killing my strawberry babies. So- what mulch do you use? Which is best for Florida? I'm not a big fan of mulching annual gardens, however, though I do use it in my cabbage and pepper beds. I prefer to add organic matter and then hoe the weeds that appear. Can you take a picture of those mushrooms? Strange that they'd kill the strawberries - cypress mulch should have been fine for them. Hey- I tried to take a picture of the mushrooms, but there are only two tiny babies right now. Last month when it rained for two days straight, I had a bed full of them. Actually, that's how I found your blog- I googled "edible mushrooms." When they sprout up again, I'll take a picture. I also have trouble getting seeds to germinate in that bed (except for basil- it sprouts everywhere). So I was blaming it on the mushrooms stealing the nutrients. ?? Over time the mushrooms will make your beds a lot more fertile; they primarily feed on decaying wood and break it down into a form plants can use. You might be dealing with low nitrogen in the bed, too. Or bugs in the mulch eating your baby seeds. If you have some chicken or rabbit manure, I'd throw it on there. How do transplants do? They limp along. I intended this bed as a permanent herb bed. I placed a discount rose in the middle and seeded various herbs all around. Basil sprouted. :) I talked with my cousin with whom I shared those herb seeds- she also had terribly low germination rates. I transplanted some daylilies and chives in there- they are not thriving but surviving. The rose and basil are doing very well. When the mushrooms sprout, they are very yellow. And the "roots" are very yellow as well. Then they mature into cream-colored puff balls, turning inverted and dark tan before dying. How do I send you pictures? I tried to paste them into this comment, but it won't. Mulching though, along with quality soil are in my opinion, absolutes for great gardening. Every year instead of tilling, we add a layer of nitrogen rich compost to the ground and a thin layer of topsoil. We plant our seeds or plants, wait for them to get a couple of inches tall, and then we add a layer of mulch around them. The cost is very minimal. The work is minimal. The upkeep is minimal. Again, a lazy gardener’s dream.